Last Sunday was a beautiful day. I spent a lot of time out on the deck. 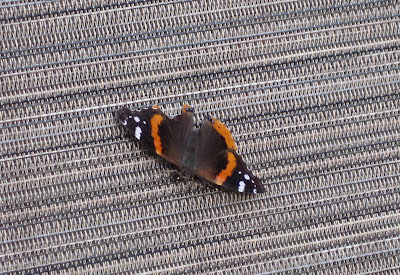 Here's a butterfly that landed on one of the chaise lounge chairs. As soon as I took the photo, it folded up its wings, paused a few moments, and took off. I didn't mean to scare it with the camera. So we needed some new pots. 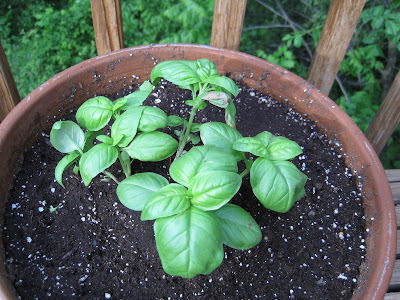 Fortunately, the basil was already re-potted: There were a couple of pots, small ones, that didn't get crunched. 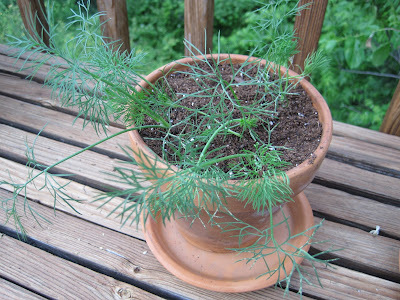 The dill got transplanted into a small pot: And the parsley got transplanted into a small pot: The oregano, well, it just got a saucer. 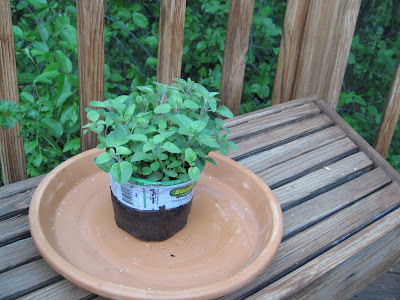 Monday night, SP bought a pot for the oregano. Tuesday night he re-potted the oregano. 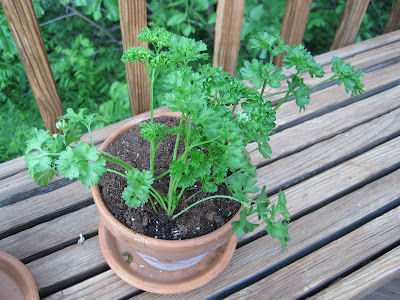 We'll have to see how the dill & parsley do; we might need to buy bigger pots for them. Of course as soon as we got the petunias and herbs transplanted, the rain moved in. 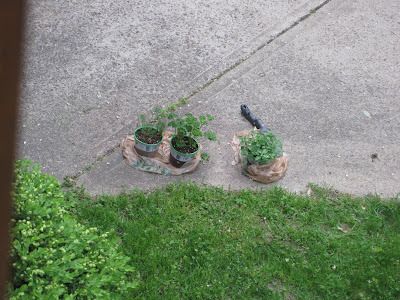 I was afraid my herbs might get too much water or be battered by storm winds, so we moved them under the deck table to shield them a bit. We're hoping the herbs do better this year than last year. Last year we tried growing basil and parsley on tables in the sunroom, but our sunroom doesn't really get much sun since it's in the back of the house. The kitchen, too, is in the back. In addition to the window sills being too small for herb pots, the sun only shines in the back windows in the early morning. It would be best to have the herb pots on a window sill in front of the house because the front windows have sunshine streaming in all afternoon and evening, but the window sills in front are also too small. 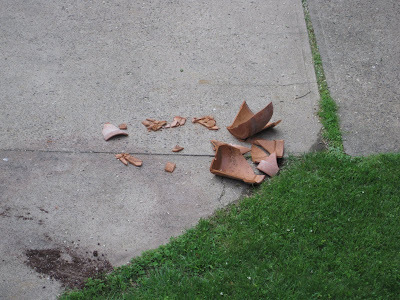 We're afraid to put the herb pots on the front patio because of the deer, rabbits, and groundhogs. Last summer, the deer ate our hosta out front and left hoof prints in the fresh mulch. Otis the Groundhog and his family are frequently seen munching on our grass and lilies. We see a lot of bunnies, too. The deck gets a lot of sun shine. Randy Raccoon goes on the deck, but hopefully we got rid of him last summer (recall the evil raccoon pooped on our deck for a month or two and got into our trash a couple of times). The squirrels and birds will go on the deck, but I don't think the squirrels will eat the herbs and the birds seem more interested in smacking into our game room window and leaving bird goo all over it. We need to put a deterrent up in that window before one of the birds smacks into it with enough force to crack it. So the deck it is. Wish us luck with the basil, parsley, dill, and oregano!